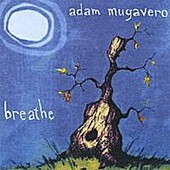 Late-night folk-pop with a home spun, bedroom quality, Adam Mugavero's Breathe is ten tracks of tender, poignant, and emotionally awake songs. Songs that live - and breathe - through Mugavero's reserved, shy voice that seems somewhat lacking in confidence at times, but uses that to its advantage, helping to make the songs that much more intimate and personal. With light percussion and various accompaniment, including strings, Mugavero's bare-bones songs come together nicely, helping put you into a slumber if you can't sleep, or offering up the soundtrack to that late night, post-party wind-down. I'll give it a B-.